Yes, I'm a little embarassed by the photos in this post. It looks like I may buy a new camera soon so hopefully that will help. The other problem is brown birds in a brown landscape. These photos explain camouflage pretty well. As usual, click on them for larger photos. Wednesday April 16th I swung by Lake Como on the way home for approximately 3 minutes. That was all the time I had before I had to be home to take over baby care duties. Think of it as speed birding. I mostly wanted to see how much ice was out. I saw a number of different types of waterfowl which was nice. The gem of the three minutes though was a pair of Red-Breasted Mergansers (first of the year) in the middle of the open water. There was still some ice but lots of open water too. Thursday, April 17th was the day of my saga with the Great Horned Owl. I had technically already seen one this year but what an up close view! When I left the school there was a Killdeer walking around in the front yard. I had the camera in my hand as we had taken photos of the owl so I figured I might as well get a shot of the Killdeer. It was only about 10-15 feet from my car. I set my other gear down and right then a car pulled into the lot and scared it off. Oh well. 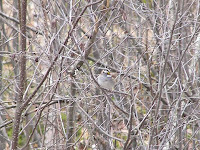 When I returned to the nature center I saw a golden crowned kinglet and a white throated sparrow. My co-worker Paul had pointed out a white throated sparrow that morning under the feeders. The golden-crowned kinglet, white throated sparrow and killdeer were all first of the year species sightings for me. 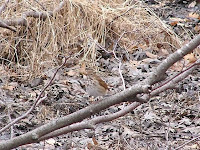 I did finally manage to get a half-way decent photo of a hermit thrush while on a lunchtime hike. Still a little blurry though. Somewhere around this time I spotted a Common Loon at Keller Lake while I drove by at high speed. On Monday I had the day off so I headed to the bass ponds for some birding. I had never been there before. I ended up with a pretty impressive list of species for the day. I saw lots of American Coots, Canada Geese, Blue Winged Teal, Pied billed grebe, Hooded Merganser, Red-winged Blackbirds, Black-capped Chickadees, Turkey Vultures, Mallard Ducks, American Robins, tree swallows, white throated sparrows, wood ducks, White Pelicans, a Great Blue Heron, Northern Shovelers, Brown Headed Cowbirds, Northern Cardinals, Song Sparrows, Eastern Phoebes, a Downy Woodepcker, Yellow Rumped Warblers (Myrtle), and what I thing was a greater-yellow legs but couldn't be sure. I will definitely have to go back there when I get my new camera. After the bass ponds I drove though the refuge on Black Dog road and stopped at the east outflow. I'm glad I did as I spotted a Nashvile warbler! There were also song sparrows, coots, mallards, and robins. I also stopped off briefly at the visitor's center (which was closed being Monday) and saw a cooper's hawk. That was a good morning of birding. I saw 7 first of the year species. The Northern Shoveler and the Blue Winged Teal were lifers for me as I had never seen them! April 22 the first chipping sparrows showed up at work. April 24th I headed out for an outreach event at work and on the way back I saw a Green Heron in a pond along Norell Ave/Co. Rd. 5. That makes for an even 70 bird species spotted so far this year.